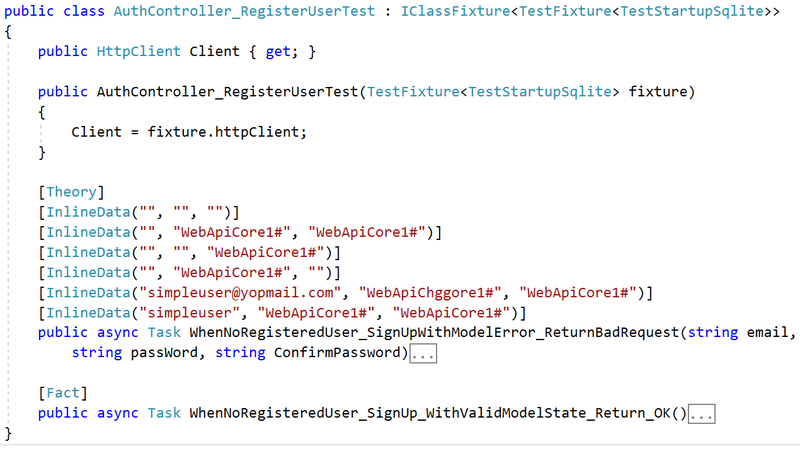 Compared to unit testing, Integration testing gives us a better return on test investment. Nowadays, we have a lot of tools to set it up easily, and it can go faster and gives us more confidence with code we have changing knowing we have not breaking existing functionalities. 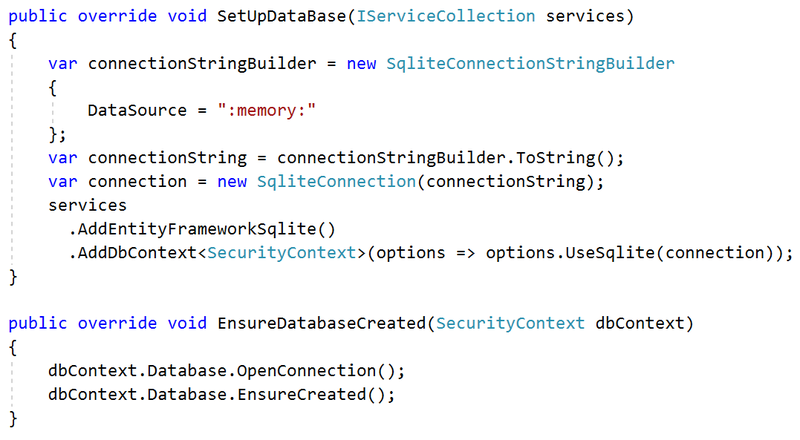 Note : InMemory is not a relational database. It is designed to be a general purpose database for testing, and is not designed to mimic a relational database. So it will allow us to save data that would violate referential integrity constraints in a relational database. 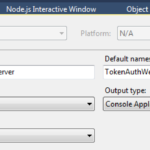 Next , overrides EnsureDatabaseCreated to ensures that the database for the context exists. If it exists, no action is taken. If it does not exist then the database and all its schema are created. 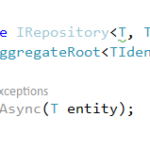 This is all good for an Asp.Net Core 1.x solution, but (in my experience) once you upgrade to 2.x it all breaks. Seems to be some issue with the testserver, because I allways get a 404 when trying to access the api. 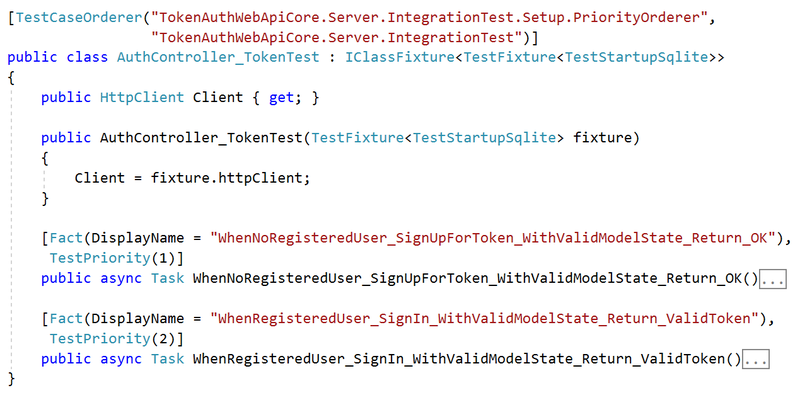 This only happens when using the derived class “TestStartupSqlite”, not when using the “TokenAuthWebApiCore.Server.Startup” class directly. 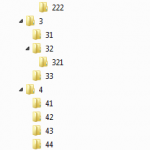 Hi, have you some redirection? if yes you must disable automatic challenge to prevent redirect on the login page that does not exist. Hi Gora, and thanks for comming back to me! No, there’s no redirection occuring. I’ve been experimenting with a simple solution without any authorization at all (in addition to the project you provide here). 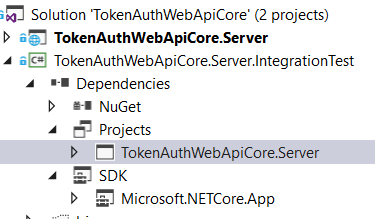 If you try to convert your project to Asp.net Core 2.x and update the nuget packages accordingly, you’ll probable experience the same problems as myself. 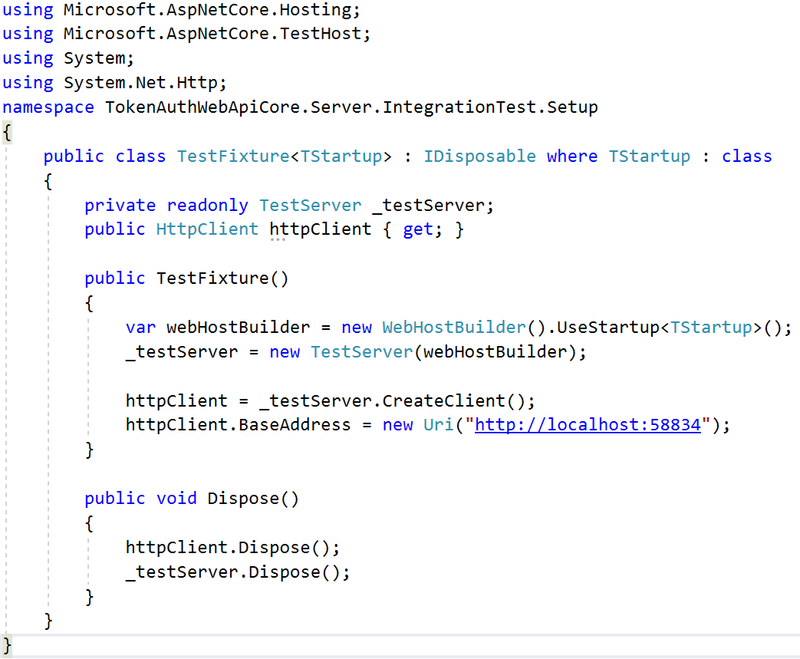 Hi, after converting project from asp.core 1.1 to asp.net Core 2.x and update nuget packages , you must also modify ConfigureServices and Configure of startup class. 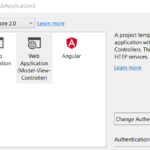 so example app.UseJwtBearerAuthentication(new JwtBearerOptions() must be moved from configure method and replaced by services.AddAuthentication(JwtBearerDefaults.AuthenticationScheme).AddJwtBearer(….. in ConfigureServices method. 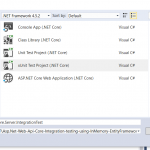 asp.net core 2.0 introduced some breaking changes. I will upgrade and fix it soon. Excellent – if you manage to post an updated working solution, I’ll be most grateful! 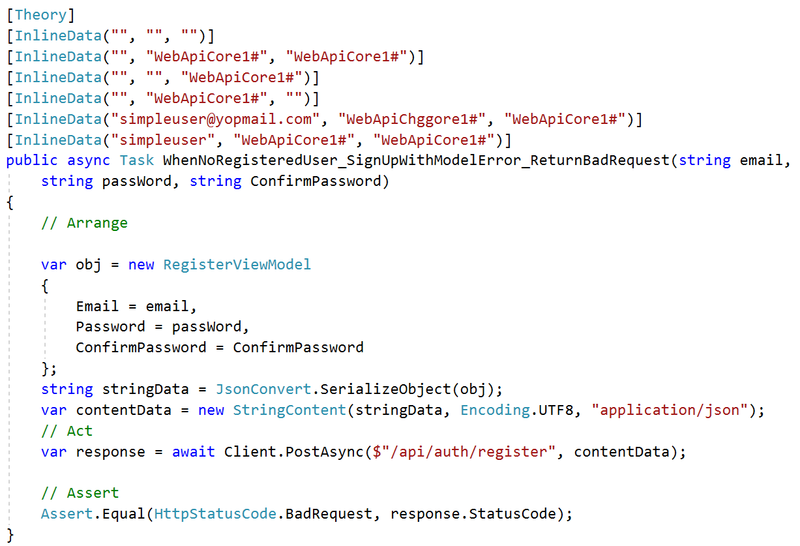 The problem I’m facing might be caused by my project configuration, as I’m using asp.net core on top of the full dotnet framework. 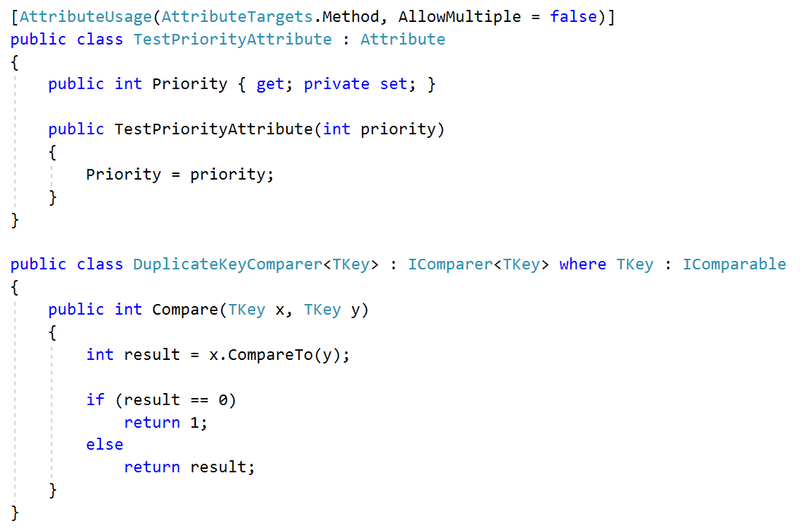 This means I have to base my test-project on the full dotnet framework as well. I’ll continue working on this and provide an update here if I discover something that might be of interest of others.